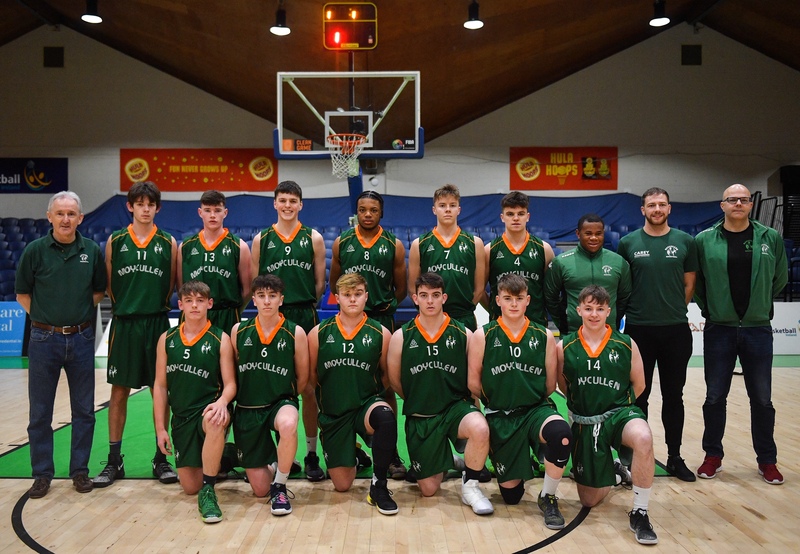 A super display saw our U18 boys team capture the U18 National Cup on Sunday morning in the National Basketball Arena when they overcame a resilient Belfast Star team by 9; 68 – 59, in what was a cracking game of basketball. It could have all been so different an hour and a half earlier when Star came out with a blistering start to see them race into a 7-0 lead after 2 minutes. James Connaire scored to settle the nerves a little but Start then pushed the lead out to 9; 2-11 after 3 1/2 minutes. However with scores from Aaron, Paul and Aaron again we forced Star into a timeout with 4 minutes to play in the 1st. Star responded well but good scores from Gerard & James Connaire saw the lead at 4 at the end of the 1st quarter; 14-18. A blistering start to the 2nd quarter from the lads, saw the momentum swing completely over to us with Gerard, Iarlaith (with a huge 3) and Paul nailing the vital scores in the first 1 1/2 minutes. When Tommy nailed another 3 we had overturned the lead and we were now on top by 6. However, Star responded with some great scores and with just over 4 minutes to go to the half the lead was back down to 1. Holding Star scoreless until 5 seconds to go in the half with some outstanding defence allowed us to get some fluidity on offence and with Daniel & Paul finding their range the lead had gone back out to 7 before some free-throws for Star saw the half-time lead at 5; 34-29. Again, excellent defence to start the 3rd meant that Star were struggling to get decent looks at the basket and when Daniel finished from the free-throw line the lead had grown to 16 with 3:44 to play; 51-35 and the Northerners were forced to call their 2nd time-out to stem the tide. And while they did make some inroads into the lead, good responses from Paul, Gerard & James Cummins saw the lead at 13 at the end of the 3rd; 56-43. It was crucial that we get a good start to the 4th and when the two James’s finished some great scores after suffocating defence the lead was now 18; 63-45 with just under 8 minutes to play. When Star did bring it down to 12, a good response from team captain Tommy settled the team. While we went into a scoring drought for the next 2 1/2 minutes, crucially Star made no inroads into the lead thanks once again to outstanding defensive pressure from all of the team. The last 2 minutes of the game were played out with a sense of inevitability to them especially when Star elected not to foul the lads to put them on the free throw line. In the end it was a clinical performance from the lads, they could have panicked or gotten tight when Star made their great start instead they focused on the defence which allowed us to get in to a flow on offence. Great credit to Star who once again where fantastic opponents and gave it everything they had. Thankfully we came out on top after a super team display. Some photos from the game. Video of the welcome back to the parish!!! Front: Avelino Assogba, James Connaire, Tommy McNeela, Iarlaith O’ Sullivan & James Cummins.